This package, FAMILY HISTORY LITE, is a basic genealogy system for beginners or others who may want fewer features starting out. 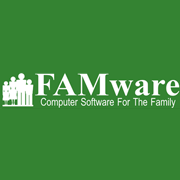 This LITE version is subset of the FAMware Bundled packages and can be easily upgraded at a later date. It has everything you need to get started. Produces a Pedigree Chart, Family Group Sheet, Family Photo Album, Birthday List, and Database Index. Easy to use dialog boxes, controls, and entry screens are provided for capturing all of your genealogical information into your own database, including notes, comments, and necessary explanations. Record sources from supporting documents such census data, birth, marriage, and death certificates, and biographical sketches. Attach family photographs. Link relatives together using the Family Constructor Window (and Batch Update feature). Photos and Family Photo report. East to learn and use, this is a great way for any family to start building a family tree. Includes myriads of wonderful genealogy reports that have a professional look, attractive layouts, portrait or landscape, and packed with useful information. All reports can be previewed (wysiwyg) before printing. Multiple data entry formats. Link relatives together quickly as you enter names using the Family Link, Family Constructor, Family Tree (Pedigree), or Family Group entry windows. Additional built-in modules include Medical History, Employment History, Residences History, Education History. GEDCOM compatible. Handles PHOTOGRAPHS (individual and family). Documents feature lets you attach scanned images of Birth, Marriage, and Death certificates to any person in your database. Huge database capacity. Many other tools and useful features: Find Relationships, keep a To-Do list, maintain a Family Calendar, plan a Family Reunion, plan a Family Night, keep an Address Book, produce Address Labels, and more. Upon order completion customer will receive a link to a download file (installable immediately). For bests results click on the download link then choose “Save As” (rather than Run), then save the installation file to your Downloads folder or to your Desktop (that is, to a location where you can find it after the download completes). When the download completes open that folder and click on the setup.exe file to start the installation. An internet connection is required during installation. During installation you will also need to provide the license key received with your order confirmation. The Complete Genealogy Builder is a GEDCOM standard-compliant genealogy data management product, supporting the full repertoire of available data types. Whether you are starting from scratch, or wish to transfer you existing data to The Complete Genealogy Builder, you will enjoy a rich user-interface with maximum navigability and ease of adding information via a logical cascading forms structure. The Complete Genealogy Builder supports additional capabilities, such as “image cutouts”, which are provided by some other programs. GEDCOM files containing these types of data will be imported and exported accordingly by The Complete Genealogy Builder. FAMILY FINANCES! Manage your budget, debt, savings, home inventory, make decisions. Will help you pay off your loans more quickly and get out of debt, or estimate what monthly payment you can afford before borrowing. Great for home loans or automobile financing. Assists you with formulating a savings plan. Produces a savings forecast schedule based on the interest rate, number of months, target balance, and monthly amount. See how your savings balance will accumulate over time. A tool for capturing your personal property, room by room, attaching photographs when desireable, and keeping track of disposition of property when that time comes. Helps you make all those important family decisions like where to go on vacation, who to marry, where to retire, etc. Uses the weighted point rating technique to weigh criteria and objectively analyze alternatives to propose the best choice. Includes a complete Family Budgeting system: “Quit Fighting About Money”, “Manage Your Credit Cards”, “Balance Your Checkbook”, and “Calculate Your Net Worth”. Myriads of wonderful genealogy reports have a professional look, attractive layouts, printed portrait or landscape, and packed with useful information. Pedigree Charts: (Photo Pedigree Chart, 4 Generation Pedigree Chart, 5 Generation Pedigree Chart, 6 Generation Pedigree Chart). Family Group Sheets: (Family Group Sheet, Family Facts Sheet, Extended Family, Family Group Record, Photo Family Group Sheet, Family Photo). Ancestor Listings: (By-Generation Ancestor Listing, Ahnentafel Listing), Descendant Listings (By-Generation Descendant Listing, By-Family Descendant Listing, Direct Line Descendant Listing). Special Reports: (Address Labels, Birthdays, Marriage Anniversaries, Photo Album, Bio-Sketch, Medical History, Residences, Education, Employment). Link relatives together as you enter names on the Family Link or Construction windows, or use the Pedigree or Family Group entry windows. Additional built-in modules include Medical History, Employment History, Residences History, and Education History. GEDCOM compatible. Handles PHOTOGRAPHS, individual and family! Documents feature lets you attach scanned images of Birth, Marriage, and Death certificates to any person in your database, or legal documents or any image saved as JPG, BMP, or GIF. Many other useful tools and special features: (Find Relationships, keep a To-Do list, maintain a Family Calendar, plan a Family Reunion, plan a Family Night, keep an Address Book, produce Address Labels, and much more. ).